The following is the result of a discussion about the possibility of a mini-submarine attack on the battleships at Pearl Harbor as described in "Pearl Harbor - Attack from Below," published in the December 1999 issue of Naval History Magazine. Falling debris from any number of explosions. Falling, high-angle anti-aircraft ammunition from shore or ships (much damage was done to the city of Honolulu by such shells). Bursts of machine gun fire (USS Maryland's mast-top gunners were in action within two minutes of the first hit and are commonly credited with downing a Kate attacking Oklahoma and one attacking California). These bullets would have been fired down upon the attacking aircraft, not upwards as is normally the case. Concussion waves striking debris in the water such as a board, mop handle, etc. The puffs of smoke/gas/vapor/air emitted by a torpedo as its motor starts during its drop, or - if dropped too low - as it passed into the water, thus creating splashes. Sunlight reflections from disturbed water. Wave interaction. Could the three sequential splashes, located as they are near the confluence of several concussion waves, be the result of their mutual interference? We've all been in a highly agitated swimming pool where water in the open suddenly seems to spurt upward for no apparent reason. The confined body of Pearl Harbor may have acted similarly under the effects of multiple strong concussions. "Three distinct rooster-tail sprays appear behind the composite shape. Each tail seems to coincide with the passing of a concussion wave. The height characteristics of the tail sprays grow toward the composite shape with the smallest tail, or the oldest, having occurred first. The sprays have a distinct characteristic shape different from the splashes one would see from torpedoes entering the water from the air, or from exploding ordnance." Two things to note here: First, the phrase "seems to coincide" tells much more than the authors possibly realize. By saying that they cannot conclusively determine if the disturbed water spouts do or do not coincide with the passing waves, they have effectively admitted that the photograph they are relying upon as their primary piece of evidence is of poor quality. Since, by their own words, they have essentially stated that this photograph cannot be used to determine the nature of an above water phenomenon, then how can they then proceed to use it as a reliable basis for determining whether an underwater object, viewed from a distance and at large angle, exists or not? More on this later. Secondly, please note that the phrase "smallest tail, or oldest, having occurred first" is another pre-determination of the evidence. Would not the "smallest tail" also occur if this splash was from the last in a string of debris - or, to be fair, from a propeller - the others having time to rise to their full height while the last one had only just started its upward climb? In other words, the smallest tail could just as likely be the newest, not the oldest, in this series. It would be more likely to leave a tell-tale wake to betray the submarine. It would present hazardous control problems. High speed maneuvering in confined shallow water remains the most dangerous maneuvering environment for submarines even today with computer assisted/automated maneuvering. The primary concern after firing would be maintaining trim. The submarine would have just lost the weight of two torpedoes in its bow and would likely broach bow-first if accelerated too soon. The mini-sub's speed and controllability after firing would likely be effected by the gaping holes of the now empty and coverless torpedo tubes. If the mini-submarine broached, it was more likely to be nose-up, not tail-up due to the lost weight of the torpedoes. If the screws broke the surface, then why didn't the conning tower and especially the periscope also broach? As mentioned previously, it's somewhat more likely that the mini-submarine would have gone nose-up if it struck a pressure wave, which would push the conning tower and periscope out of the water first. Both are more likely to raise a larger and more significant splash. If the mini-submarine pitched so far nose-down as to broach the screws without also broaching the conning tower and periscope, then a simple geometric exercise shows that it would have struck its nose into the shallow bottom. If significant portions of the mini-submarine broached between the concussion waves, why then was there no sighting by the many eyes anxiously brought to that area of the harbor in anticipation of the next torpedo to strike? The intersection of the torpedo tracks is hardly conclusive, occurring as it does in the primary dropping area for the aerial torpedoes. And, it raises an interesting question of its own: If the mini-submarine did indeed occupy the space at the intersection of the tracks, then how did it avoid being struck by one of the aerial torpedoes that were also dropped in that confined area? The character and source of the oblong shadow that the Autometric Inc. analysis is based on is questionable. Photographs taken during the attack clearly show scattered clouds over Pearl Harbor, even before the explosions and anti-aircraft fire started. It would be quite possible that the shadow in question is that of a cloud or from the explosion of a large AA projectile. Then there is the matter of just where does one start to measure the extent of an indistinct oblong, such as a shadow. The margin for error/interpretation is so large as to make a determination of dimensions subject to doubt. Finally, the idea of spotting a submarine beneath the surface of muddy, polluted Pearl Harbor from the oblique angle of the Kate's photograph is doubtful. It's difficult enough to see a submarine in clear water from directly above, much less than trying to view one from an angle in pre-EPA days of Pearl Harbor, rotten as it was with stirred up mud and leaked and spilled fuel oil. In fact, underwater visibility in Pearl Harbor waters is an interesting area of discussion in itself. When the US National Park Service took control of USS Arizona in 1980, US Navy representatives stated that all twelve of her 14-in guns had been removed. However, three years later when the Park Service sent divers down to survey the wreck, they found that the forward turret was actually intact and still contained all three 14-in guns. In other words, the visibility in Pearl Harbor waters was so bad that for about forty years no one had been able to see these guns or even the roof of the turret just ten feet below the surface. It would be interesting to know what were the water visibility conditions in Pearl Harbor at the time of the attack. The nature of the photograph itself must be examined. What Autometric, Inc. actually used was a "higher-quality duplicate image." Although of "higher-quality," it is still a duplicate copy of a photograph taken some fifty years ago and one most likely made with an ordinary camera. Loss of detail is unavoidable in the copying process and there are hazards in that what were obvious defects in the original negative, such as scratches or "bright spot" overexposures, can now be perceived as "true" elements in the copies. These kinds of problems usually present a hazard in making a definitive judgement of what or what is not in such a photograph, but apparently not enough of one to deter the authors of the article from their conclusions. The torpedo hits themselves need to be carefully examined. The Japanese Type A mini-submarine carried two 45 cm Type 97 torpedoes. These had a warhead of 350 kg (772 lbs. - please note that the Naval History Magazine article incorrectly describes the warhead size) consisting of Type 97 explosive, which is roughly 7% more explosive than TNT. These Type 97 torpedoes were very unreliable and were removed from service soon after the start of the Pacific War. In fact, the only time they were actually used operationally was at Pearl Harbor. So, even if a mini-submarine had penetrated into Pearl Harbor and had managed to fire its torpedoes, it is quite possible that they simply would not have worked. By comparison, the Kates's at Pearl used 45 cm Type 91 Mod 2 torps that had a warhead containing 205 kg of Type 97 explosives. So, the warheads on the mini-submarine's torpedoes were 70% larger than those on the aircraft torpedoes and should have caused noticeably more damage. But, research shows no special note of any torpedo hit on West Virginia as being considered more destructive than any other, except by location. The greatest damage was caused by torpedoes striking in close proximity to each other and by torpedoes striking where they never should: The above-water side shell. West Virginia probably suffered a total of seven torpedo hits. One struck and removed the rudder. Four struck just below the armored belt (and well below the armored deck) causing flooding, but not penetrating the Torpedo Defense System (TDS). Two struck the side shell above the armored belt (and above the armored deck) as the ship listed, which permitted water to flood across the armored deck and down into the interior of the ship over the TDS. The side shell above the waterline was further ruptured by the explosion of secondary ammunition due to a bomb hit (this is very apparent in close-ups of the fire-fighting tug alongside after the attack - the side shell is destroyed and a 5"/25 anti-aircraft gun hangs askew over the gap). This hole permitted further flooding over the armored deck level through the side shell due to the list. There is a more subjective question to be raised, as well. The warheads on the mini-submarine's torpedoes were moderate in terms of explosive power. That being the case, what would be the reason that the commander of the mini-submarine would have split his only weapons between two battleships which were specifically designed to be resistant to such attacks? From the statements of Ensign Kazuo Sakamaki, captured commander of one of the mini-submarines at Pearl Harbor, there is no mention that such a dilution of effort was a part of the normal attack procedure. Would it not have been more logical, especially given the knowledge of the unreliable nature of the torpedoes, to have concentrated these weapons against a single target? For example, as known by the Japanese, it had taken Korvkpt. Günther Prien two tries and several torpedoes in order to land two hits and sink the anchored HMS Royal Oak. Had Korvkpt. Prien split his weapons during his second attack, he might not have been successful. Given that background, does it not then seem that the authors are trying to fit their desired result into the available evidence? The authors make the judgment that because one mini-submarine could negotiate the opened anti-submarine net at the harbor entrance, multiple submarines could do the same. Fair enough, but the net was not the only anti-submarine defense in place, it was only the first element of that defense. There were also destroyers assigned to anti-submarine patrol. Frankly, it is equally supportable that the fact that USS Ward (DD-139) caught a mini-submarine that managed to pass the first defensive element would show that the anti-submarine defense was adequate and the authors of the article offer little evidence to the contrary. One must consider that these mini-submarines were small craft with none of the modern navigation equipment that we think of today. They could only be guided by the commander of the mini-submarine sticking his periscope out of the water to visually determine his course. This leaves an easily seen wake in addition to the evidence of the periscope itself. It is in this manner that USS Ward found the "other" mini-submarine in the first place and it was exactly these unavoidable characteristics that let USS Monaghan (DD-354) catch and sink another mini-submarine trying to enter the harbor after the attack had begun. For these reasons, it is likely that any other mini-submarine trying to sneak into the harbor would also have been discovered. Finally, what happened to the alleged mini-submarine after it made its attack? The idea that it slipped out in all the confusion after the attack sounds plausible until you actually go out and see just how narrow that channel is. Although correctly described in the article as being 400 yards wide and 50 feet deep in the middle, what is not noted is that the 50 foot deep section was less than 100 yards wide at the time of the attack. Again, one must note that these mini-submarines could only be navigated by the commander taking periscope sightings, especially in a narrow and twisting channel such as the one at Pearl Harbor. With every USN ship that could sail going out that same narrow channel, looking for submarines as they went - the Ward's report being common knowledge by this time - sorry, but the "sneaking out" theory has a hard time passing the credibility test. That only leaves the possibility that the alleged mini-submarine didn't make it out, but instead sank inside the harbor. However, if the mini-sub didn't make it out and still remains inside the shallow waters of the harbor, then where is it? How is it that the USN, which regularly maintains the harbor by dredging operations, hasn't run across the wreck? 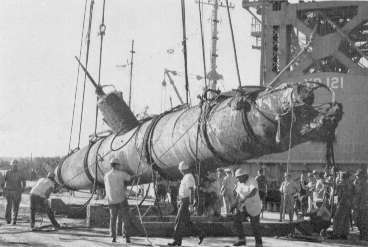 The mini-submarine found in Keehi Lagoon in 1960 and later salvaged. It is now at Eta Jima, Japan. Photograph copyrighted by Keystone Press. There's one more point that should be considered: All five of the mini-submarines are accounted for, there are no "missing" ones that could be this alleged intruder. First, USS Ward's victim. Second, USS Monagahan's victim, raised shortly after the attack. Third, Ensign Kazuo Sakamaki's mini-submarine that was abandoned and which later washed up on the beach. Fourth, the mini-submarine discovered in Keehi Lagoon in 1960. Fifth, the mini-submarine encountered by light cruiser USS St. Louis (CL-49) as she exited the harbor. Although USS Ward's mini-submarine has not been found [See below], not even the authors of the Naval History Magazine article are claiming that this submarine, with a shell-hole in its conning tower and its hull wracked by close-ranged depth charges from both the destroyer and a PBY, could have then made it to Battleship Row. The next three mini-submarines were either found with their torpedoes still on-board or fired them long after the attack began, so they cannot have been the alleged intruder. The fifth mini-submarine fired both of her torpedoes at USS St. Louis as that ship exited the harbor near the end of the attack and was possibly damaged by her return fire (the torpedoes struck a coral reef and exploded without damaging St. Louis). So, there isn't any "missing" mini-submarine that could have launched the alleged attack. In conclusion, we want to make clear that we are not saying that the mini-submarine theory is impossible. What we are saying is that it is highly unlikely. The authors of the Naval History Magazine article have proven nothing more than that they can maintain an argument in its favor. However, one must consider the character of their primary piece of evidence. It is a copy of a poor quality, nearly 60 year-old photograph that has been subjected to a number of highly advanced computer techniques which are themselves subject to a number of assumptions and margins of error. Forget Tom Clancy. These techniques are seldom conclusive with modern photography, much less with copies of aged and grainy photographs. Moreover, the interpretation of any image is ultimately done by the human eye, which is a subjective, not objective, instrument. The authors make the best case yet for the mini-sub theory, but all they have really done is raise the possibility. They have not proven it conclusively, or even eliminated a fraction of the competing theories. I can't really improve on Joe's and Tony's comments on this, but I would like to add a warning that I've learned from bitter experience. A lot of these new theories depend on computer enhancement of old photographs. Now, sometimes these are fairly innocuous, but in other cases quite radical changes are made in the light values, contrast, sharpness, edge values, etc. The effect of all these is that once a photograph has been digitally enhanced, the viewer isn't seeing what the photographer took anymore, he's seeing what the computer thinks the photographer saw. The sorts of things that can happen are that small areas of shadow can get linked into a single larger area of complex shape, unrelated light and shadow patterns can get related to give a three-dimensional object where none exists and so it goes. There is also the long-known spooky-world law that states if you look for something long enough, you'll find it regardless of whether it is there or not. Without commenting on this particular case, as a general rule I view with the gravest suspicion anyone who formulates a theory and then goes off to look for evidence to support it. I place very little faith in anything that depends on photoenhancement for new evidence unless it is strongly supported from elsewhere with independent information. In the time since this essay was first published in 1999, the authors of the original Naval History Magazine article have published two further works on this subject. The first appeared in the June 2000 issue of Naval History Magazine entitled "Update: Attack from Below" and the second entitled "Attack from Below" in the December 2000 issue of Naval Proceedings. For an excellent critique of these latest offerings, I suggest that you visit the Rumors forum of the Pearl Harbor Attacked website. The mini-submarine attacked by USS Ward (DD-139) and PBY 14-P-1 was found on 28 August 2002 by a team from the Hawaii Undersea Research Laboratory, not far from the location reported by USS Ward. Both torpedoes are still on-board. The discovery is summarized, with media, on the Hawaii Undersea Research Laboratory website. Pictures of the 4" gun on USS Ward (DD-139) that "fired the first shot of the Pacific War" may be found in the Naval Weapons Section of NavWeaps. Added postscript section "Additional articles." Added postscript section "Midget submarine sunk by USS Ward found."